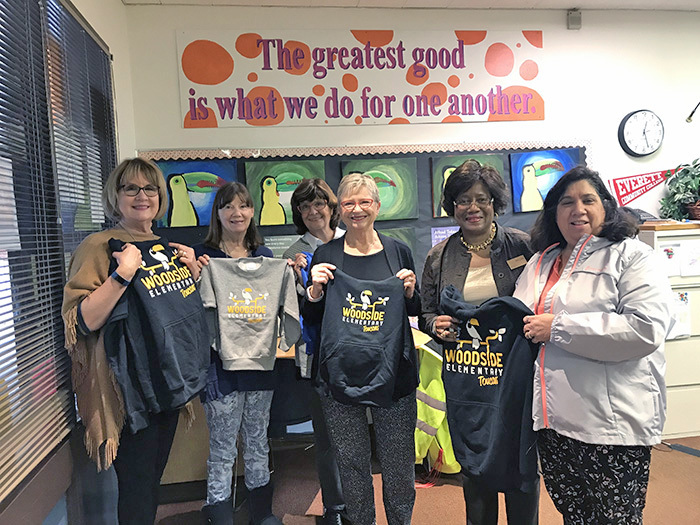 From left to right: Nancy Knox, Kathleen Corbiere, Judy Cromwell, Linda Drake, Principal Betty Cobb, and a representative from the PTA. Photo courtesy of the Mill Creek Women’s Club. Following their “Thanks for Giving!” program and luncheon in November, the Mill Creek Women’s Club tallied up the donations received from their members and donors and were able to provide all items on the “wish lists” from the charities they support: YWCA Pathways for Women Program, Woodside Elementary School, and the Mill Creek Food Bank. “Spirit” sweatshirts for all students, backpacks, school supplies, underwear and socks were provided to Woodside Elementary School, and cash and other needed items went to the Mill Creek Food Bank. The club also reviewed the “wish lists” provided by the three charities to determine what other items could be provided from their donated funds. The board of the Mill Creek Women’s Club has now authorized the purchase of all items on the wish lists, including new window blinds for the YWCA shelter, mattresses, shower curtains, and bath mats; field trip expenses, payoff of lunch expenses, books and “artist in residence” costs for Woodside; and a side by side commercial freezer for the Food Bank, two USB Shipping Scales, a leaf blower, folding chairs and plastic shopping and produce bags. The Mill Creek Women’s Club thanks all donors and sponsors for their help in making a huge success of this annual event! Mill Creek Women’s Club and Mill Creek Food Bank volunteers. Photo courtesy of Mill Creek Women’s Club.